This healing method relates to the 'laying on' of crystals at certain points of the body whilst the patient is lying down. We have seven main chakras, that relate to different areas of our bodies, emotions or auras. Certain crystals resonate in harmony with different chakras and therefore, energy fields can be cleansed by placing the correct crystals in the relevant areas of the body. Crystals vibrate to a frequency of their own, and come in many different forms, shapes and sizes. No-one knows how crystals and gemstones can help the healing processes of the body. 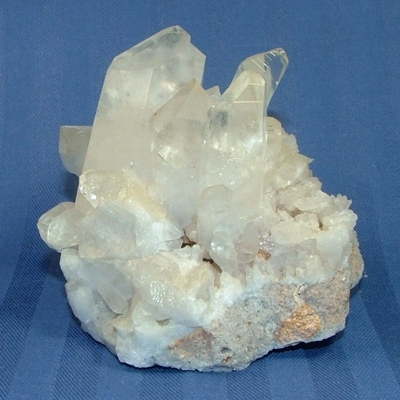 It may be that the very nature of crystals spontaneously increase the level of harmony in their immediate environment. The energy and nature of a gemstone is a universal energy, one block in the foundation of life. When our own energy systems begin to break down under stress, the simple but powerful resonance of a crystal may help us to clarify and reinstate our own harmonious patterns of health. Crystals and gemstones have always been highly prized for their beauty, their healing and spiritual properties. The rich and powerful have worn gemstones for years. As well as being a display of wealth, the wearers hoped that the qualities and virtues thought to reside in the stones, would 'rub off' on them. Healers, priests, spiritual seeks and shamans have always been drawn to the clarity and purity of crystals, always making use of their special powers. Crystals form only in the right circumstances. Deep within the earth's crust, superheated gases and mineral-rich solutions at enormously high temperatures sometimes find their way along cracks and fissures toward the surface. As they cool, the atoms (which until now have been randomly agitated) now arrange themselves into more stable relationships with their neighbours. This means that the end effect is created by the building up of regular three-dimensional repeating patterns of atoms, known as crystal lattices. Crystals continue to grow until all the free atoms are arranged or until conditions change. As the solutions cool more and more and the pressure drops, different elements can join in combination. Usually harder minerals i.e. diamond, emerald and quartz will form at a higher temperature and pressure, compared with softer minerals such as calcite, turquoise and selenite that crystallize at much lower temperatures. A typical crystal treatment will take about an hour and you will remain fully clothed during this time. The only item I may ask you to remove, are your shoes! Please wear comfortable, loose-fitting clothes. There will be soft, relaxing music in the background. Old feelings and memories may surface and be expressed when crystals are used.. The purpose of crystal healing is to help those whom you work with to balance and align the physical, mental, emotional and spiritual bodies so that they can get at their own inner resources of power and truth. True healing happens when you take full responsibility for yourself and when you do, you claim the power to heal. If you are interested in receiving some crystal healing then please contact me by clicking on this link.